Make a sheet cake the size that you will need. Using white buttercream icing, ice the top of the cake using a cake spatula making sure it is nice and smooth. Now make a red colored icing and a blue colored icing. Fill three bags with icing using star tip, size #18 on each. One bag will be filled with white icing, one with red icing and one with blue icing. Start with one corner of the side of the cake and make three horizontal rows of red icing. Next to that make three horizontal rows of white icing and then three horizontal rows of blue icing. Continue in this pattern until all the sides of the cake are done. 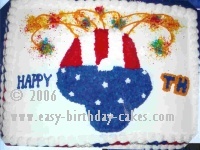 This is shown in the first 4th of July cake picture. With white icing and round tip, size #5, draw the four in the middle of the cake being sure to divide the stripes and solid bottom part of the four. Refer to the picture. Make the three red stripes of the four using the same red icing and star tip, size #18. Now fill in the white stripe of the four using the same white icing and star tip, size #18. Next fill in the bottom part of the four using the same blue icing and star tip, size #18. Do you have a 4th of July cake to share? Click here to share your 4th of July cake! Using white icing and star tip, size #24, make the stars on the top of the blue part of the four. Using red, blue and yellow edible sparkles (sometimes called edible glitter), sprinkle it at the ends of the lines and around them (refer to the picture). Use blue icing and round tip, size #5 and print HAPPY on one side of the four. Using the same blue icing, change the tip to star tip, size #18 and make the T & H on the other side of the 4. Now use the golden yellow icing and star tip, size #18 and go around the T & H.
Now use your white icing and star tip, size #18 (or bigger if you wish) and make the shell border around the top and bottom edges of the sides of the cake. If you have made a 4th of July cake that you would like to share, please submit your cake here and let us know how you made it! We would love to feature your cake on our site. Please make sure to include a photo of your cake and a description of how you made it, so that we can all share ideas and learn from each other! See 4th of July Cakes That Were Submitted By Others To This Site!